Yoga participants meditate while in a lotus pose during the yoga session Saturday at the 2nd Annual Namaste at the Park at H-E-B Park in Edinburg. 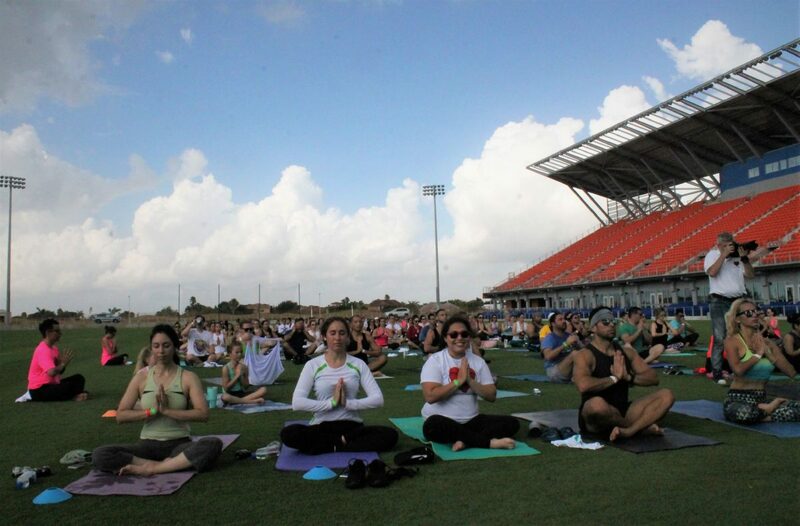 EDINBURG – H-E-B Park, where soccer fans are usually cheering after a goal has been scored, was turned upside down Saturday morning as calmness, serenity and Zen took its place for the second annual Namaste at the Park. Approximately 200 people laid out their exercise mats on the soccer field under the partially sunny skies for a 75-minute yoga session by instructors Christina Martinez and Nyssa Fox from Casa OM Yoga. Martinez, founder of Casa OM Yoga studio, began the event a year ago in memory of her mother, who died of Alzheimer’s. Proceeds go to the local Alzheimer’s foundation. Martinez, who entered the world of yoga four years ago after looking at a photo of a lady in a yoga pose and thought how could someone hold a pose without being considered muscular. Martinez, who is also an instructor, shares her space with partner and co-founder, Nyssa Fox. Together they run the McAllen studio, which is located on Hackberry Avenue and Main Street and serves people of all ages. She also gave some daily tips to follow. Catia Hernandez Holm from Weslaco was one of the students in attendance, stretching her muscles during the morning exercise. When the yoga session wrapped up, rain entered the skies above with many attendees calling the moment a holy shower from up above.